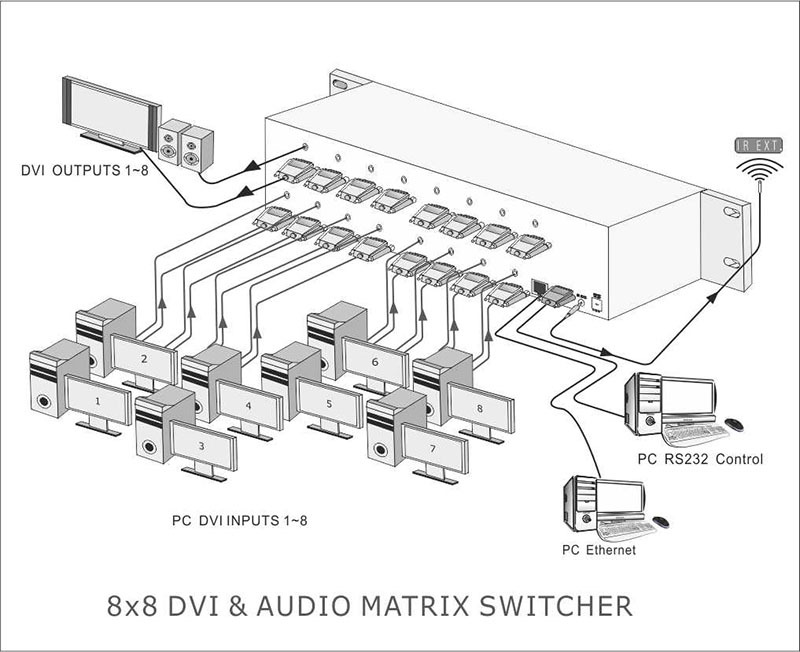 SB-8808LCM 8x8 DVI Matrix Switch with Audio- SHINYBOW Technology Co., Ltd. 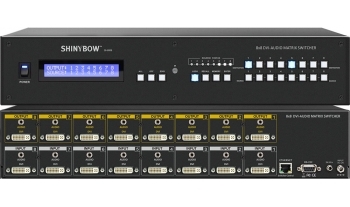 The SB-8808LCM is high-performance 8x8 matrix routing switcher for DVI (Digital Visual Interface) and Stereo Audio signals. This switcher supports data rates up to 2.25 Gbps, enabling 1920x1200 DVI formats and UXGA/WUXGA/DVI resolution to any HD display. High Definition Digital signals can be selected and distributed to any 8 outputs simultaneously. 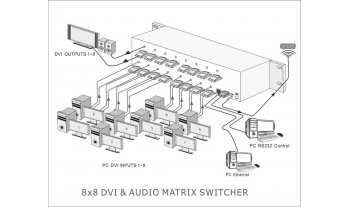 The Switcher is certified as being fully DVI and HDCP compliant, with CE,FCC certification. Support high resolution DVI sources routed to DVI displays, monitors, projector or audio receivers. The EDID can be selected between four (4) different modes. Control is provided via Front panel push buttons, IR remote, TCP/IP (not a webbrowser) or RS-232. An RS-232 Windows GUI interface is provided for matrix routing control (Windows only).